KATE GRADY ALWAYS KNEW she was different from other people. She may have looked like a teenage girl, with long blonde hair and her mother's blue eyes, but inside she was poles apart from her classmates. She didn't stand out from the crowd because of her inner differences, quick intelligence or subtle powers of persuasion, but rather because of her unusual and haunting beauty. Her father's long legs and mother's pale skin completed the physical package, which Kate took to new heights by using dark eyeliner, black lipstick and black nail polish. She imagined herself a novice Goth when she first started high school, even if her parents did not approve at first. By the time she finished her sophomore year she was bona fide Goth, a fact which her parents tolerated because her grades never slipped and she never got into any serious trouble. Kate's main form of attire was black in all shades: deep, faded, speckled, riveted, or striped with gray. She favored satiny black blouses or tank tops, ankle-length skirts with billowy hems, black nylons or no stockings at all, and shabby combat boots which always seemed to be partially unlaced. Her black leather jacket was a prized possession – a birthday gift from her mother's former boss Madge Tilley – as was her skull-and-crossbones pewter ring, worn proudly on the middle finger of her right hand. Other favorite trinkets included blackheart ear-studs, a black leather pentagram wristband and a blood-red sacred heart pendant surrounded by pewter frame with a clear glass teardrop, all suspended by a thin silver chain. She was popular with her teachers because she was smart, excelling in every subject at school and rarely missing class. She was also respectful to their faces, a trait which did not go unnoticed by her select group of friends. "Why antagonize the establishment?" Kate reasoned. "By treating our teachers with deference and consistently scoring good grades, I defy their preconceived notions in relation to my appearance." "That's easy for you to say," said her best friend Chloe Benedict as they walked down the main hallway at English High School. "You always get good grades, Katie. Me, on the other hand – it's a constant struggle and hardly worth the effort." The two girls paused in front of their lockers, the army-green paint chipped in places. Kate smiled at her friend, attempting to encourage her with words. "I told you I'd help you, Chloe. Just say the word and we can setup tutoring sessions." Chloe shook her head, the black fringes of her page-cut hair brushing across the collar of her black leather jacket. "I don't think so." She shrugged, returning the smile. "I'm hopeless, as you well know." Kate admired her friend's brilliant white teeth, the tiny pearls set against thin lips colored with light pink lipstick. Chloe was her partner in the Goth look, but she drew the line at black lipstick. Her light blue eyes were feathered by thick lashes, her tiny body encased in black jeans and skull-and-crossbones tee-shirt. The black leather jacket was identical to Kate's, who gave it to her the previous Christmas so they could match. "You are not hopeless," Kate said, trying to sound stern as she opened her locker. "With just a little work, you can certainly bring your grades up to snuff." When she did not receive a snappy reply from Chloe, Kate turned to look at her friend. For one of the few times in her life, Chloe Benedict was speechless. She stared away from Kate, her mouth slightly agape and her eyes wide. "What's wrong with you?" Kate asked her, slightly annoyed. "Who the hell is that?" Chloe whispered, her voice whispery and filled with awe. Kate turned around to follow Chloe's gaze. She paused, taken aback as the tall specimen of perfect human form walked down the hallway. He seemed to be without a care in the world, confidant in his graceful moves and formidable appearance. His clothes were black – tight jeans and tee-shirt – over which he wore a long, dark gray duster coat that reached to his ankles but above his rounded-toe black boots. His hair was the color of wheat, like a freshly-baked country biscuit, falling straight to his collar in a slightly dull sheen and tucked behind his ears. Kate's eyes were drawn to the unusual earring he wore, which was a tiny depiction of a silver dagger impaled through his left lobe with a red crystal blood drop dangling from the end. Her gaze travelled to his face. He was pale, yet the barest hint of darker stubble around his chin and over his upper lip seemed to join in concert with the coal black of his wide-set eyes. "Looking pale and sickly is all the rage these days," Kate thought, somewhat critically. "Yet it fits him and doesn't seem to lessen his machismo." His two male companions, both non-descript and shorter of stature but dressed in similar fashion, walked on each side of him, just a slight fraction behind his long step. All three stared straight ahead, yet as they passed by Kate and Chloe in the hallway, the tall one turned his head to aim a quick glance at Kate. She drew in her breath. He was staring straight at her, there was no mistaking it, but the contact was all too brief as he moved on. She caught a whiff of his scent as went by, a decidedly heady brew of cigarettes with a faint hint of Grey Flannel cologne. Chloe tugged on her arm. "Who is he, Katie? Do you know him?" "N-no," Katie responded with some difficulty, still breathless by her millisecond eye contact with him. "I have no idea who he is. A new student, maybe?" Chloe nodded vigorously. "Yes, that must be it. I can't say much for his two mangy-looking friends, but the tall one is absolutely stunning! Did you see the way he looked at you?" "Did he? I didn't notice," Kate replied weakly. "We have to find out who he is," Chloe muttered as she turned back and opened her locker. She fished around for her history book. "If he's new, maybe he has some of the same classes as we do. Unless, of course, he's a senior. Does he look like a senior?" She found her history book. "A-ha!" She turned to Kate. "Okay, are you ready? We only have about a minute before the bell." Kate followed Chloe the short distance down the hallway to their history class. She was wordless, still stunned by the appearance of the tall man in the duster coat. He wasn't really a man per say, especially if he was a new student, but it didn't seem fitting to call him a boy. No one who looked and moved like he did could be anything but a man. He was striking and well-beyond the scope of students at English High, in a social and physical sphere all by himself. After their history class got underway, Chloe went about trying to discover his identity. She whispered in the ear of a few of their classmates, or sent quick text messages to others she felt might be "in the know." Before the hour was over, Chloe nudged Kate from behind where they sat in the fourth row. Kate leaned her head back slightly. "His name is Kirk Lester," Chloe said softly, almost triumphantly. "He transferred in from Burke High a few days ago." Kate silently formed the name on her lips: Kirk Lester. The name was simple, yet unique. She tried to imagine the sound of his voice, but of course could not. She had never heard him speak. Would she ever hear him speak? "He's a senior," Chloe continued quietly, although there was no mistaking the excitement in her tone. "I just knew it!" "Miss Benedict," the stern voice of their history teacher, John Martino, boomed from the head of the room. "Is there something you'd like to share with the rest of the class?" Chloe's face turned a deep shade of red. "No, Mr. Martino. Sorry." Kate hid a smile, ducking her head to stare at the history book open on her desk. Mr. Martino began talking again, this time about the particulars of the Civil War. Kate groaned inwardly. She was counting the seconds until the bell freed her from the boring rambles of Mr. Martino, who always waxed prophetic when it came to the Civil War. The man was truly obsessed, often ignoring other momentous events in American history in the process. She forced herself to pay attention, however, as her quest to obtain good grades also extended to Mr. Martino's class. Every once in awhile her mind wandered back to Kirk Lester, replaying the moment in time when he glanced at her in the hallway. Their all-too-brief connection made her shiver inside - not from fear, but anticipation. She knew she could easily draw him in, but it was suddenly important to her that he show his interest by natural means. The old-fashioned way, as her mother would say. She was bound to see Kirk again since they attended the same school, but she was uncertain it would ever amount to more than casual passing in the halls. Why should there be anything more? He probably drew girls to him like bees to honey, what with all his confidant swagger and pale good looks. Kate felt she was just another face among many, doubting he would ever see her in a singular light. Yet some small, inner voice urged her to hope for more. *Please Note: Bloodlust is a work of fiction. Names, characters, places and incidents are the product of the author's imagination or are used fictitiously. Any resemblance to actual events, locales, organizations, or persons, living or dead, is entirely coincidental and beyond the intent of the author. *Copyright: ©Deidre Dalton (aka Deborah O’Toole). All rights reserved. No part of Bloodlust may be used or reproduced in any manner whatsoever without written permission from the author. *Estimated Completion: 2019. 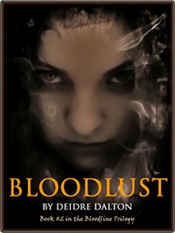 Storyline, estimated completion date, content and book cover art for Bloodlust may be subject to change.